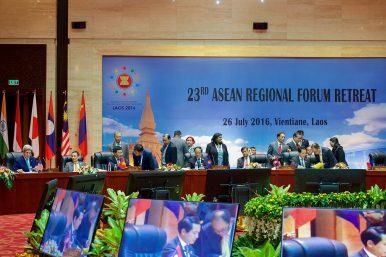 Should North Korea Be Kicked Out of the ASEAN Regional Forum? The Trump administration continues to call for Pyongyang’s suspension despite the challenges that this entails. WASHINGTON, D.C. – On August 2, ahead of the next round of ASEAN-led summitry in Manila, U.S. Acting Assistant Secretary of State for East Asian and Pacific Affairs Susan Thornton made headlines when she told reporters that the United States was looking for ways to get North Korea suspended from the ASEAN Regional Forum (ARF) (See: “Tillerson’s First ASEAN Voyage: What’s on the Agenda?”). Though the move has actually been mulled by Washington for a while now, it reflects the Trump administration’s determination to diplomatically isolate Pyongyang despite the challenges it continues to face in doing so among Asian states (See: “Why Was a North Korea Official in the Philippines Ahead of the ASEAN Regional Forum?”). When North Korea was first admitted to the ARF – an ASEAN-led forum set up in 1993 to promote regional security dialogue and cooperation – unanimously at the foreign ministerial meeting in Bangkok in July 2000, it occurred within a context that is dramatically different from the one today. At the time, the leaders of the two Koreas had just held a historic summit in June, and Pyongyang appeared to be intensifying its diplomatic outreach to international organizations. But over the past few years, that context has been getting progressively worse. North Korea, especially since Kim Jong-un assumed power in 2011, has shown no signs of giving up its nuclear weapons and has only accelerated the pace of its battery of missile and nuclear tests. These, along with other provocations, have led to growing frustrations among many Southeast Asian states at Pyongyang’s behavior, even though they continue to preserve some links to the regime (See: “The Myth of a North Korea-Malaysia Special Relationship”). Indeed, the lead up to recent ARF meetings has tended to about not whether we will see a tough statement on North Korea’s behavior, but how tough it will be. As we approach this year’s ARF, the North Korean threat has only continued to grow, with an intercontinental ballistic missile (ICBM) test launch on July 4 raising even more alarm. The Trump administration, facing a series of rather unpalatable options and finding that Kim is currently unwilling to either give up his weapons or talk on Washington’s terms, has been pressing Asian states to sever their links with Pyongyang and diplomatically isolate it as part of its “maximum pressure, maximum engagement” strategy. Trump administration officials have been making clearly at various bilateral and multilateral meetings with their Asian counterparts since he came to office (See: “North Korea-Myanmar Links in the Spotlight Under Trump”). One of the moves that Washington has been pushing for is North Korea’s suspension from the ARF. The Diplomat understands that U.S. officials have suggested this to Southeast Asian states over the past few months, not just bilaterally, with a particular focus on key states such as Philippines which is chairing ASEAN this year, but also multilaterally at meetings such as the Special U.S.-ASEAN Foreign Ministers’ Meeting that occurred in Washington, D.C. back in May (See: “What Was the First Special US-ASEAN Meeting Under Trump Really About?”). From Washington’s perspective, the case for North Korea’s suspension from the ARF is quite clear. If the ARF’s goals, outlined in the First ARF Chairman’s Statement adopted back in 1994, are to foster dialogue and consultation on political and security issues and to make significant contributions towards confidence-building and preventive diplomacy in the region, and if member states are supposed to play a role in facilitating their realization, North Korea is not living up to its role as a member and is now clearly part of the problem rather than part of any solution. That should be enough grounds for Pyongyang to be suspended from the ARF, or at the very least for the grouping to begin considering what it would take for this to occur to send a clear message that its provocative behavior cannot continue. But within the ARF, such a proposal would no doubt be a hard sell among some. Generally, though even the fiercest proponents of the ARF process and ASEAN-led regionalism more generally would concede that the ARF – through its ongoing three-staged evolution from confidence-building to preventive diplomacy to conflict resolution – has not helped solve major security problems, the forum nonetheless continues to be seen as a useful multilateral platform for major powers to manage these issues. North Korea’s inclusion was an important step for the ARF’s evolution in this regard: it filled a void by becoming the only major security forum that provides the opportunity for confidence-building between Pyongyang and major powers as well as ASEAN member states. For proponents of ASEAN-led regionalism, this role is important not only as a public good, but also as one pathway to ensuring that ASEAN and Southeast Asian states remain in the driving seat of Asian regional cooperation: the foundation of the much-prized notion “ASEAN centrality.” Seen from this perspective, suspending North Korea would be a major loss for ASEAN. Indeed, though this is far from a mainstream view, some have even called for ASEAN to play an even stronger role on the engagement front in the North Korea issue. For instance, Surin Pitsuwan, who still remains actively engaged following the end of his tenure as ASEAN Secretary General, has called not for North Korea’s suspension from the ARF, but for ASEAN to instead use its convener role within the ARF as grounds for its inclusion in the six-party talks to have a well-deserved seat at the table. More specifically, it is difficult to conceive of exactly how suspending North Korea would work practically speaking. The ARF currently does not have an explicit expulsion provisions, and, like other ASEAN-led forums, it is geared more towards bringing more countries in at a reasonable pace rather than suddenly kicking existing ones out (with a case in point being the fact that calls for individual member states to be suspended from ASEAN, be it Myanmar in the past or Cambodia more recently, have not actually gone anywhere). There could be a case made that North Korea is violating some parts of the rather vague “criteria for participation” for the ARF adopted back in July 1996,, which specifies that participants must “subscribe to and work cooperatively to help achieve the ARF’s key goals.” But that interpretation would have to be shared by other current members too in order to get the consensus required for suspension to occur, and that level of consensus does not appear to exist for now. The designated ASEAN chair for a given year can play somewhat of a role by putting the item on the agenda, but at least this year, the Philippines has been unwilling to do so. This will not be an easy decision for other ASEAN members as well, either because of their own ties to North Korea or their broader outlook towards regional multilateralism. The same goes for the new “suspension measures or requirements or stipulations” that Thornton referred to in her remarks this week. As she along with other top U.S. Asia officials no doubt knows, some Asian states are still remain vehemently opposed to such coercive measures being included in diplomatic forums, particularly when they are seen as being U.S.-led. Indeed, the temptation for too many states will be, as one Southeast Asian diplomat put it to me, “to take the so-called long view” and hope that other forms of pressure on North Korea exerted by other states will be sufficient enough for Washington to soon ease up on this front. Meanwhile, the ARF and other ASEAN-led forums will continue to express their discontent through the typical ASEAN-like fashion: private conversations and relatively stronger statements. This is the classic version of the collective action problem playing out in the real world. And it is bound to make any attempt at realizing this quite an uphill climb. Why Was a North Korean Official in the Philippines Before the ASEAN Regional Forum? A recent engagement speaks to diplomatic efforts being waged by various actors amid growing alarm.